Located at the epicentre of the Golden Triangle of Art, a location which allows the guest to visit the three most important museums of the city, just metres way –Museo del Prado, Thyssen-BornemiszaandReina Sofía – Hotel Mercure Madrid Centro (Lope de Vega) is one of the best options for visitors who love culture. For those who wish to enjoy their stay in the capital of Madrid, the hotel is very close to emblematic points such as Sol, Gran Vía, Plaza Mayor, the Congress of Deputies of the Spanish Parliament and just 800 metres from the Atocha high speed train station. Previously called Hotel Lope de Vega, now Mercure Madrid Centro ****, it continues to have the theme of “The Phoenix of Wits”, Félix Lope de Vega Carpio. The facilities have captured the essence of the 17th century, with each floor having a theme, for example: Floor 1: The Spanish Golden Age of Literature, where each room has the name of one of Lope de Vega’s contemporaries (Room 103, Luis de Góngora; Room 105, Miguel de Cervantes; Room 107, Francisco de Quevedo, etc. ); and Floor 7: The Loves of Lope, each room having the name of one of the many women who passed through the life of the writer (Room 702, Elena Osorio; Room 703 Isabel de Urbina, etc.). 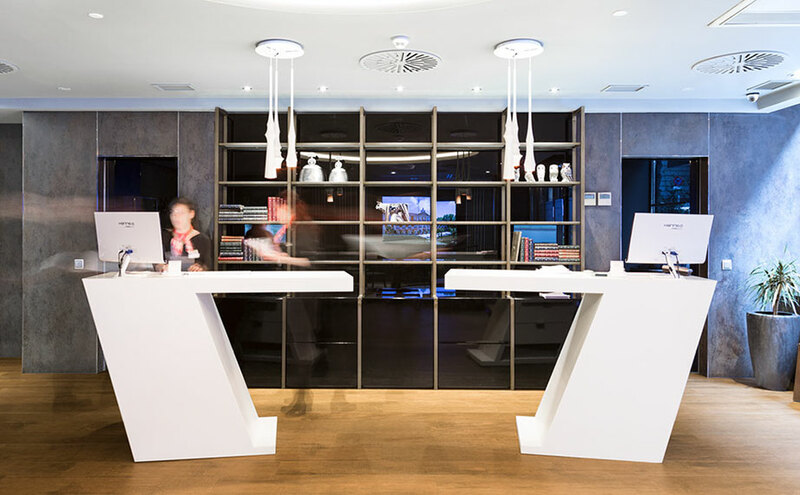 We can find the Solid Surface from PORCELANOSA Group, KRION®, in the reception of the hotel in the form of inverted letter “L’s”, in KRION® colour 1100 Snow White, the ideal colour for high transit areas due to its easy cleaning, reparability and regenerative properties. We would like to thank HotelesTematicos.com for using KRION® in the reception, allowing our compact mineral to play a small part in the history of Spain related with the great authors of the Spanish Golden Age.